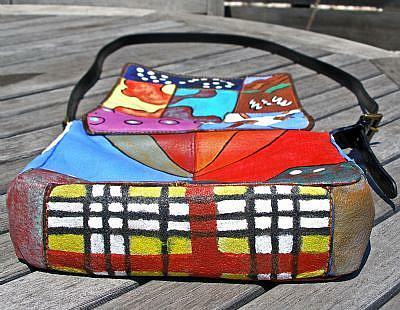 Happy Patterns is a very bright and abstract handpainted leather shoulderbag purse by "Wilson's", that I repurposed with a theme of "Plaid and Polka Dots". The "plaid" section is on the bottom of the bag, and is my VERY whimsical take on a "burberry" plaid pattern (which you can see in the 2nd photo here). The iconic black, white, and red pattern known as the Burberry check (or haymarket check) was first used as a lining for the Burberry trenchcoat in 1924, and was popularized by Humphrey Bogart in Casablanca and Peter Sellers in the Pink Panther films. 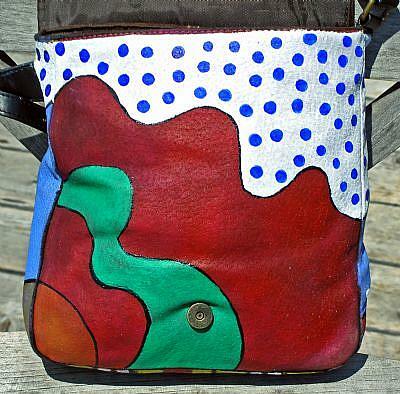 The "polka dots" areas are basically found in several different areas of the bag. The back view (3rd photo here) has some white polka dots riding a "wave" and various colorful geometric shapes as well. The inside front (fourth photo here) is done in wavy orange, red, green and wavy blue polka dots on white background. 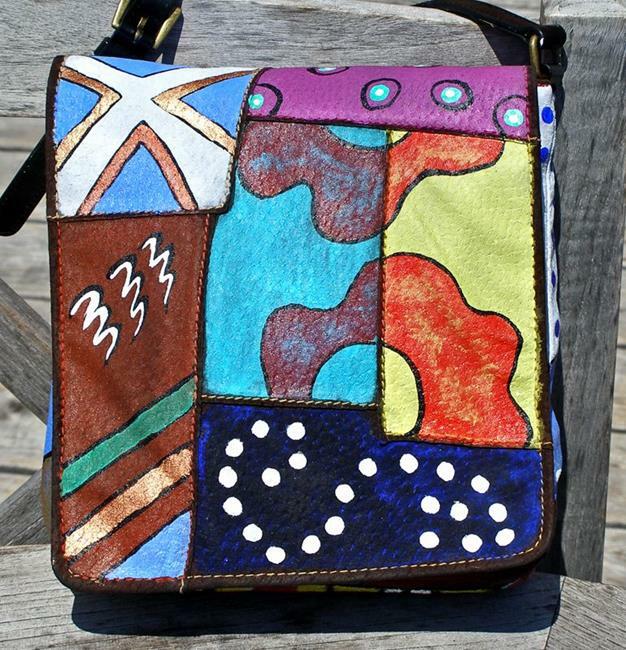 Yes, this bag just SCREAMS FUN!!! I just started painting and applying differing colors and patterns in a random and abstract way, wherever and whenever I felt like it. I didn't stop until I was satisfied that all the colors and funky patterns looked "right" together. 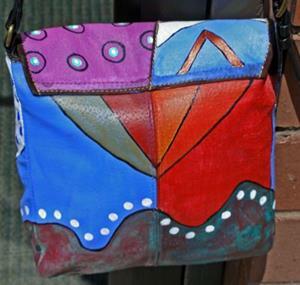 To create this piece, I thinned down acrylic paints to a very thin consistency of glazes, and then applied them to the bag in many layers starting with the thinnest layers first. This "prepped" the bag for the later layers of pigment. Because the paint I used was so thin (like fabric paint), the paints act more like a "dye" on the leather bag so it won't be stiff, and the paint won't "chip" off... the leather is still VERY pliable and soft - not stiff at all. As I mentioned above, this leather handbag is by "Wilson's" and the tag inside the bag reads: "Wilson's Leather Maxima". 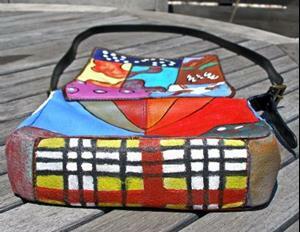 Yes, ladies, this is ONE FUNKY & CRAZY COLORFUL "TRASHION" HANDBAG!